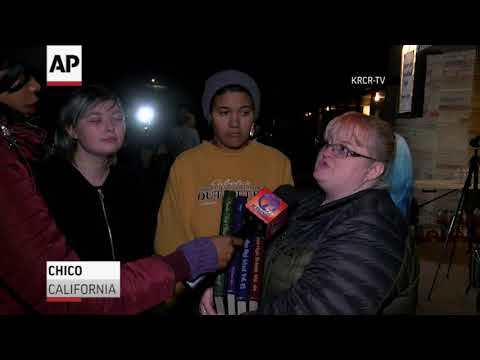 CHICO, Calif. (AP) — A thunderstorm that dumped more than 4 inches (2.5 centimeters) of rain in 24 hours flooded several areas of the Northern California city of Chico. CHICO, Calif. (AP) _ TriCo Bancshares (TCBK) on Tuesday reported fourth-quarter earnings of $23.2 million. The bank, based in Chico, California, said it had earnings of 76 cents per share. The results beat Wall Street expectations. The average estimate of three analysts surveyed by Zacks Investment Research was for earnings of 70 cents per share. SAN FRANCISCO (AP) — Wells Fargo is donating $3.25 million to help residents and business affected by a deadly wildfire that leveled a Northern California town. The San Francisco-based bank said Friday that $2 million will go toward helping evacuees currently staying at a Red Cross shelter in Chico that's scheduled to close. The money will help subsidize the rent of up to 300 families for up to six months and go toward temporary housing for seniors and workers. CHICO, Calif. (AP) — State officials have issued a lease extension to the remaining evacuation center housing people displaced by a deadly Northern California wildfire that was set to close by the end of January. Butte County spokeswoman Casey Hatcher tells The Sacramento Bee the American Red Cross shelter at the Silver Dollar Fair Ground in Chico is still targeted for Jan. 31 closure despite the extension. Police say a mass overdose at a house in Chico that killed one man and left four people in critical condition appears to have been largely caused by the dangerous opiate fentanyl, the Enterprise Record reports. CHICO, Calif. (AP) — Federal officials say survivors of a deadly Northern California wildfire will not lose disaster assistance if they are unable to get their homes inspected in the next month. Kevin Hannes, of the Federal Emergency Management Agency, said Saturday that he wanted to dispel a rumor that Butte County residents would lose benefits if their homes don't receive a FEMA inspection within 30 days. CHICO, Calif. (AP) — Bob Talk hadn't even transferred the title for his new trailer — the one that was supposed to get him off the streets — when Northern California's deadly wildfire whipped through and turned it to ash. He had lived in the trailer park in Paradise for all of three days. SAN FRANCISCO (AP) — A major storm brought localized mudslides and street flooding to California and some people had to be rescued from stranded vehicles, but fire-scarred areas escaped large-scale damage. CHICO, Calif. (AP) — A businessman pained over the destruction to the town of Paradise caused by a deadly Northern California wildfire on Tuesday gave $1,000 each to students and staff members from the local high school. Real estate developer and restaurant owner Bob Wilson arrived in the nearby city of Chico with two suitcases stuffed with checks totaling $1.1 million for Paradise High School's 980 students and 105 teachers and staff members. Authorities say there has been one more fatality in the Camp wildfire, bringing the death toll from it to 84. They also say the fire is 95 percent contained. The blaze that started Nov. 8 leveled Paradise, destroying more than 13,000 homes. The Butte County Sheriff's Office says more than 560 names remain on the missing list. She's sad about everything she lost but realizes that others have far less. CHICO, Calif. (AP) — Amy Sheppard packs her belongings into a plastic garbage bag as rain drips around her, readying to move on from a field by a Walmart where thousands of evacuees had taken refuge from a deadly Northern California wildfire. Sheppard, 38, her sister and niece, who is 1, are looking to move into a dry hotel after camping in the field for four days. They lost their home in Magalia and the jewelry-maker tears up as she thinks about what's next. CHICO, Calif. (AP) — Given the size and scope of the devastation after a deadly wildfire swept Northern California, experts say the search to find the missing and identify victims could take months. A transmission line that utility Pacific Gas & Electric Company says malfunctioned minutes before Northern California's deadly wildfire was supported by steel towers that toppled over in a fierce 2012 storm. 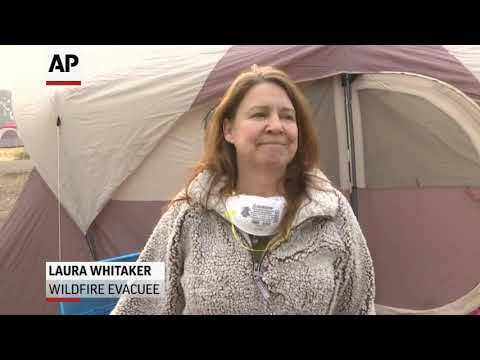 CHICO, Calif. (AP) — It's been 12 days since Christina Taft started the frantic search for her mother Victoria, who refused to evacuate their Paradise home as flames neared, and six days since she gave authorities a cheek swab to identify remains that are likely her mother's. She still hasn't received confirmation that her mother is dead, and says she's been frustrated by what she feels is a lack of communication from Butte County officials. Butte County Sheriff Kory Honea says that's about 300 less than what was posted at the start of Sunday. CHICO, Calif. (AP) — Volunteers in white coveralls, hard hats and masks poked through ash and debris Sunday, searching for the remains of victims of the devastating Northern California wildfire before rains forecast this week complicate their efforts. CHICO, Calif. (AP) — Nearly 1,300 people remain unaccounted for and the death toll from the country's deadliest wildfire in a century climbed to 76, authorities said Saturday, hours after President Donald Trump surveyed what remained of a decimated Northern California community. Authorities have increased the number of homes and other buildings burned by a massive Southern California wildfire. The figure rose Friday evening to 713 buildings destroyed — many of them homes — and more than 200 damaged, but the tally is continuing. The death toll still stands at three, including two people found in a car and one in the rubble of an incinerated home. CHICO, Calif. (AP) — Fire refugee Anna Goodnight sat on an overturned shopping cart Thursday in a Walmart parking lot as she ate scrambled eggs and tater tots while her husband drank a Budweiser. PARADISE, Calif. (AP) — With at least 130 people still missing, National Guard troops searched Wednesday through charred debris for more victims of California's deadliest wildfire as top federal and state officials toured the ruins of a community completely destroyed by the flames. CHICO, California (AP) — A utility accused in a lawsuit of igniting California's deadliest and most destructive wildfire said it contacted a customer about a power line on her property but that sparks were not part of the discussion. Pacific Gas & Electric Co. said it had been in touch with Betsy Ann Cowley to inform her about future planned work on a power line that had been shut down. CHICO, Calif. (AP) — Casey Peck had never prayed so hard. His fire engine was trapped with dozens of cars and panicked people as an inferno roared through the Sierra Nevada foothills town of Paradise on Thursday, hot enough to peel the firetruck's paint and melt its hoses, blowing relief valves designed to withstand 900 degrees and immolating nearby vehicles. CHICO, Calif. (AP) — Teachers, aides and bus drivers in Northern California loaded more than 100 school students into cars and school buses as a fast-moving wildfire approached, driving hours through smoke and flames to safely reunite the children with their families, according to one of the teachers who helped get people to safety.